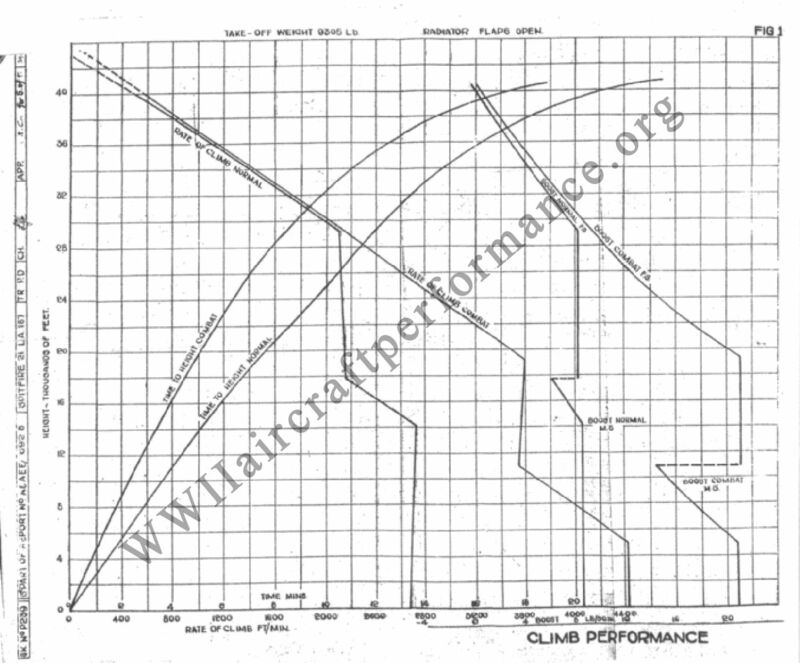 Rate of climb at full throttle height, MS gear, +21 lb/sq.in., 2750 rpm = 4440 ft/min. at 4900 ft.
" MS gear, +9 lb/sq.in., 2600 rpm = 2740 ft/min. at 14,200 ft.
" FS gear, +21 lb/sq.in., 2750 rpm = 3615 ft/min at 19,200 ft.
" FS gear, +9 lb/sq.in., 2600 rpm = 2125 ft/min. at 29,000 ft. Estimated service ceiling, 2750 rpm = 43,400 ft.
" 2600 rpm = 42,400 ft. Combat level speed (+21 lb/sq.in., 2750 rpm) = * 406 mph at MS gear full throttle height (7000) ft.
...........Further to level speed performance trials of the prototype Spitfire F. Mk. 21 PP.139, climb and level speed performance trials have been completed on the first production version of the type, and these form the subject of the present part of the Report. .....2.1 General. The principal external features of the aircraft, as tested were given in the 8th part of this Report. ...........As the aircraft had been engaged on a long programme of tests, both at this Establishment and at the Contractor's works, the external condition had deteriorated considerably when the performance trials were made. The paintwork was chipped and some filler had worked out of the joints in the wing leading edge. .....2.2 ASI systems. 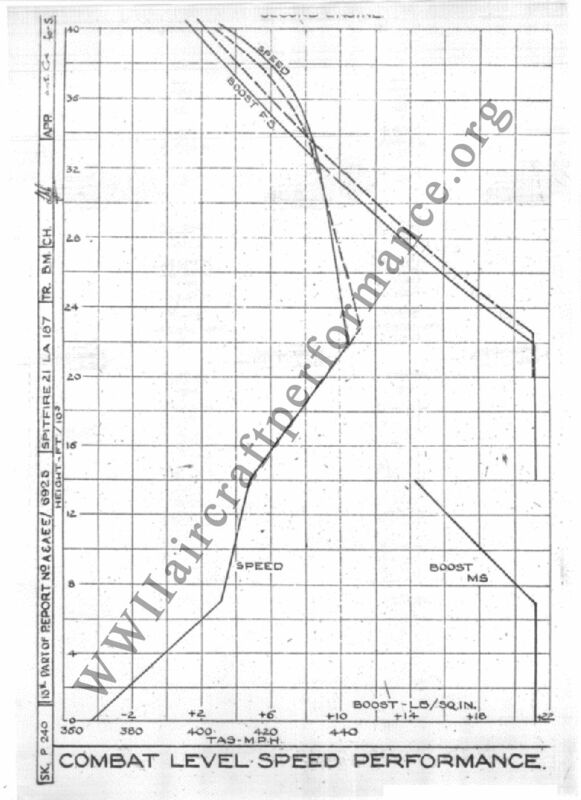 All indicated air speeds quoted in this Report were obtained from an ASI connected across the pitot and static sides of the Mk.VIIIC underwing strut-mounted pressure head. Details of the system may be obtained from the 12th part of this report. Carburetter, RR. Bendix type 9T, series 40. Automatic lean metering jet GN.8239 0.240"
Automatic rich metering jet GN.9294 0.250"
Power enrichment jet D.25251 0.312"
.....* A concession has been granted to allow combat rating to be used continuously on the climb at this Establishment. Direction of rotation Left hand. .....2.5 Loading. The tests were made at a take-off weight of 9305 lb., corresponding to fighter load with full fuel, oil, and ammunition and all service equipment. .....2.6 Special instruments. An automatic observer, installed in the radio compartment, was used throughout the climb tests, the normal pilot's instruments being used for level speeds only. The observer consisted of a panel, containing a watch, altimeter, ASI and boost gauge, which was photographed at intervals of about 10 seconds during the climb, by a Bell-Howell A.4 camera, in conjunction with a T.35 type control fitted in the cockpit. ...........Climbs were made to 40,000 ft. at normal and combat rating, using the best climbing speeds obtained from partial climb tests. In each case the radiator flaps were fully open and the supercharger gear was changed at the best height for optimum performance, established first by separate climbs in MS and FS gear. The climbs at normal rating were done with the first engine (No.1659) fitted, and those at combat rating with No.16680 fitted. ...........Level speed trials were done at combat rating between ground level and 16,000 ft. in M.S. gear and between 12,000 and 40,000 ft. in FS gear. The engine failed before the tests in FS gear were complete, so these were repeated with the replacement engine fitted. The tests in MS gear were done with the replacement engine only. .....4.1 Climb. These were corrected to ICAN standard atmospheric conditions by the methods of Report No. A.&A.E.E./Res/170, using a supercharger constant of 0.002. The best climbing speed, obtained from partial climbs at three altitudes, was found to be 170 mph ASI up to 25,000 ft., falling off linearly to 140 mph ASI at 40,000 ft., at both normal and combat rating. To obtain optimum performance, the supercharger gear was changed from MS to FS gear when the boost was 6.25 lb/sq.in. at normal rating and 14.25 lb/sq.in. at combat rating. .....Fig. 1 gives curves of rate of climb, time, and boost against height, at normal and combat engine conditions and the results are tabulated in Tables I and II. .....4.2 Level speeds. These were corrected to ICAN standard atmospheric conditions and to 8850 lb. (95% of the take-off weight) by the methods of Report No. A.&A.E.E./Res/170, using a supercharger constant of 0.002. The position error correction used was measured on this aircraft and was fiven in the 12th part of this report. The compressibility correction was calcuated by the methods of Report No. A.&.A.E.E./Res/208. A "strut" correction, based on A.R.C. Report No. 6420, was also applied. .....Curves of speed and boost against height at combat rating are given in Fig.2, and the results are tabulated in Table III. .....5.1 Due to a slight inaccuracy in the adjustment of the boost control the tests were not done in all cases at exactly the nominal boost. It is calculated that altering the boost on test to the nominal value would have increased the normal rate of climb below full throttle height by about 70 ft/min. in MS gear (boost 0.4 lb/sq.in. too low) and 100 ft/min. in FS gear (boost 0.7 lb/sq.in. too low). .....The level speed and rate of climb at combat rating would not have been affected appreciably. .....5.2 The propeller tip mach numbers attained during the level speed tests exceeded 0.90 above 18,000 ft., the maximum being 0.97 at 36,000 ft. The outside air temperature on test varied from 12 deg.C above to 15 deg.C below the ICAN standard values. No allowance has been made for the possible effects of high tip speeds on the reduction methods. .....An attempt is being made to find the effect on level speed of reducing the rpm at combat boost. .....5.3 Comparison is made with level speed results obtained on the prototype Spitfire 21, PP.139, but on making the comparison it should be borne in mind that the effects of high tip speeds on the performance reduction methods are not taken into account. .....Propeller tip Mach numbers obtained on that aircraft were approximately the same as those on the present aircraft, but the air temperatures varied from 6 deg. C above, to 4 deg.C below standard, which was a much smaller range than obtained with LA.187. .....*After allowing for weight and boost differences, the production aircraft, LA.187, is about 15 mph TAS slower than the prototype in FS gear, and 20 mph TAS slower in MS gear. Part of this difference may be attributed to the fact that LA.187 was fitted with a flat windscreen, as opposed to the curved type on PP.139, and the former aircraft also had an external circular rear-view mirror, which item was not fitted to PP.139. Tests on Spitfire IX aircraft at the R.A.E. indicate that the loss of performance at the full throttle heights attributable to the flat windscreen would be 5 mph TAS in MS gear and 9 mph TAS in FS gear under the conditions of test, (see RAE Tech. Note Aero.1284). The remaining speed loss of the production aircraft would be attributed to differences of surface finish, engine powers and propeller efficiencies. 2,000 0.75 2680 " " " "
4,000 1.50 2690 " " " "
6,000 2.25 2700 " " " "
8,000 3.00 2710 " " " "
10,000 3.70 2715 " " " "
12,000 4.45 2725 " " " "
*14,200 5.25 2740 " +8.8 " "
16,000 5.95 2445 " +7.4 " "
20,000 7.75 2160 " " " "
22,000 8.65 2150 " " " "
24,000 9.60 2145 " " " "
26,000 10.55 2140 168 " " "
28,000 11.50 2130 162 " " "
*29,000 11.95 2125 160 +8.4 " "
32,000 13.50 1715 156 +5.9 " "
34,000 14.80 1430 152 +4.4 " "
36,000 16.35 1140 148 +2.8 " "
38,000 18.40 825 144 +1.5 " "
40,000 21.40 500 140 +0.1 " "
Estimated Service ceiling 42,400 ft. Estimated absolute ceiling 43,000 ft.
2,000 0.45 " " " " "
*4,900 1.10 " " " " "
6,000 1.35 4290 " +19.7 " "
8,000 1.85 4000 " +17.4 " "
12,000 2.90 3570 " " " "
14,000 3.45 3580 " " " "
16,000 4.05 3595 " " " "
18,000 4.60 3605 " " " "
*19,200 4.90 3615 " " " "
20,000 5.15 3490 " +20.0 " "
22,000 5.75 3200 " +17.1 " "
24,000 6.40 2905 " +14.7 " "
26,000 7.10 2610 168 +12.6 " "
28,000 7.95 2320 164 +10.5 " "
30,000 8.85 2030 160 +8.6 " "
32,000 9.90 1740 156 +6.9 " "
34,000 11.15 1445 152 +5.1 " "
36,000 12.70 1155 148 +3.6 " "
38,000 14.70 865 144 +2.0 " "
40,000 17.45 575 140 +0.4 " "
Estimated Service ceiling 43,400 ft. Estimated absolute ceiling 44,000 ft.
Rad. flaps closed, rpm, 2750. 2,000 378 378 -10.3 -0.2 +0.1 21.2 "
4,000 389 378 -10.3 -1.2 +0.2 21.2 "
6,000 400 378 -10.3 -2.1 +0.3 21.2 "
*7,000 406 377 -10.1 -2.6 +0.5 21.2 "
8,000 407 375 -10.0 -3.1 +0.6 20.1 "
10,000 409 365 -9.5 -3.8 +0.6 18.1 "
12,000 411 356 -9.0 -4.6 +0.7 16.2 "
16,000 421 341 -8.1 -6.2 +1.0 21.2 "
18,000 428 337 -7.9 -7.3 +1.2 21.2 "
20,000 435 333 -7.3 -7.9 +1.4 21.2 "
*21,800 442 327 -7.3 -9.0 +1.7 21.2 "
24,000 440 313 -6.5 -9.5 +1.8 18.3 "
26,000 439 301 -5.8 -9.6 +1.8 15.8 "
28,000 438 290 -5.0 -9.7 +1.9 13.5 "
30,000 436 278 -4.3 -9.5 +1.8 11.2 "
32,000 434 267 -3.6 -9.4 +1.8 9.0 "
34,000 432 254 -2.8 -9.2 +1.8 7.0 "
36,000 428 243 -2.0 -9.1 +1.8 5.1 "
38,000 419 226 -0.7 -8.7 +1.5 3.2 "
40,000 407 207 +0.8 -7.5 +1.0 1.4 "